The wire whip incorporates the maximum amount of air in whipped mixtures for fluffier whipped cream and angel food cakes. This model also includes a 1-piece pouring shield for guiding ingredients to their proper destination, and the bowl itself locks tight to the base. The tilt-back mixer head allows for easy access to bowl and beaters. 325-watt stand mixer with 10 speeds and 67-point planetary mixing action. Solid, all-metal base; 5-quart stainless-steel bowl; 2-piece pouring shield. Uniquely styled tilting head allows clear access to the beater and bowl. Multipurpose attachment hub; flat beater, dough hook, and wire whip included. Measures 14 by 8-2/3 by 14 inches. ATTENTION ALL CUSTOMERS: ALL ELECTRONIC ITEMS ARE 110V. 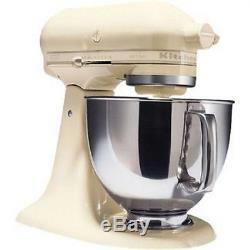 The item "KitchenAid Stand Mixer tilt 5-Quart ksm150psac Artisan Almond Cream Brand New" is in sale since Wednesday, April 10, 2013.